OK, let's stop there a moment. My Great Predecessors has a quote from Gligoric. Where does that come from? It comes from Gligoric's I Play Against Pieces, of which I have a copy, published by Batsford in 2002. 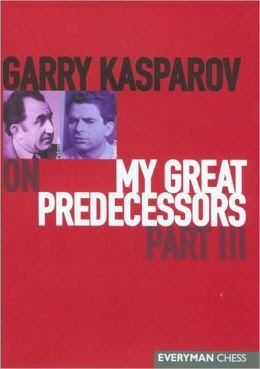 The game against Petrosian appears on pages 176 to 181. Note that the text is not exactly the same as is given in My Great Predecessors, presumably because that work is not quoting from the English-language version of I Play Against Pieces but from another version and then being translated into English. Anyway, Ray mentions Gligoric on this occasion (albeit plagiarising My Great Predecessors as he does so) but, as we shall see, this is not always the case. "According to Gligoric?" I'm not seeing any Gligoric in Ray's note. You can see some Gligoric here, though. In the Spectator Gligoric has disappeared, but he is the author of the comment that now appears, slightly altered, as Ray's. This is a double plagiarism. What is fantastic about this particular note (which again I have cut short) is that there is a glaring error of English in it: "given the queen the opportunity to came back into play", instead of "to come back into play". But because Ray is so busy plagiarising - and plagiarising so crudely - he fails to correct the error and copies it directly into his piece. You'd have thought they might have caught that at the Spectator. Once again I have cut a note short. And once again we have a missing, plagiarised-by-Ray Gligoric. So for the record, here's the note from I Play Against Pieces. Now there's a interesting little difference: what Ray gives as his own note is in fact a quote from Petrosian. I'd like to say, and show you, where the Petrosian quote is from, as with Gligoric above: but unfortunately I don't know (enlightenment via the comments box would be gratefully received). What I can say, though, is that Ray's appropriation of the quote makes this a triple plagiarism. So we finish with two notes copied word-for-word in a piece which plagiarises three different authors. Ray Keene is a prodigious plagiarist. But this effort is special even by his own standards. I'm not sure whether these Keene articles are cathartic or symptomatic of monomania. My Great Predecessors is too long and tedious. It's great to have a version (in the Spectator) where the less important bits have been chopped out making it much easier for the reader to digest. Who is this Kasparov fellow anyway ? If Ray Keene doesn't mention him then he can't have been important can he ? BTW I beat Ray in a simul once, so I know he knows a thing or two about chess.